“Pond” is a new album from DataObscura label, whose author is Robert Davies; it is represented by four, almost 15-minute tracks. As it is explained at the label site, this work is inspired by the romantic utopia “Walden” by Henry Thoreau, an American transcedentalist, where he combined descriptions of nature and criticism of consumer society. In fact, he wrote it in partial isolation from people, having settled in a house in the forest. As for Robert Davies, he reflected his impressions through delicate and tranquil drones, which flow through ears into the listener’s mind. The first track, “Summer Algae Pool”, immerse you into the endearing world of driftweeds, that attract your consciousness with mild greeny light, appearing between the tangles. “Ripple Glisten” is truly full of radiance, with its softly ringing drone and occasional piano tints. “Amidst Dark Reeds” seemed to me mainly of twilight nature, it may project a sweet feeling of the process of falling asleep, though it can also be sunny, full of playing rays and warmth. The album is crowned with “Boughs Overhanging”, that weave unnapparently and smoothly above the line between water and the land, as if trying to connect these absolutely different, but neighbouring elements. Evidently, “Pond” is not only music, in my opinion, it is also a picture, but this picture isn’t visible in material world, it comes into existence by means of sound and gives one’s imagination much food, which consequently leads to creation of soundscapes of silent and natural beauty. This music will abstract you from wordly vanities, you will turn your face to your inner source. The cover picture is designed by Robert Davies, and, I think, it is appropriate for the album, expressing the author’s plan; on the picture you can see the heroes, perhaps, of the first composition – leaves of water lily with characteristic radial notch from the circumference to the center, that are floating on the water surface. Pond is a static water body, and in metaphysical notion, that always occur in the works of ambient composers, it could be the best symbol for psychic stem, unflinching, but at the same time opened for beauty, bliss and wisdom. 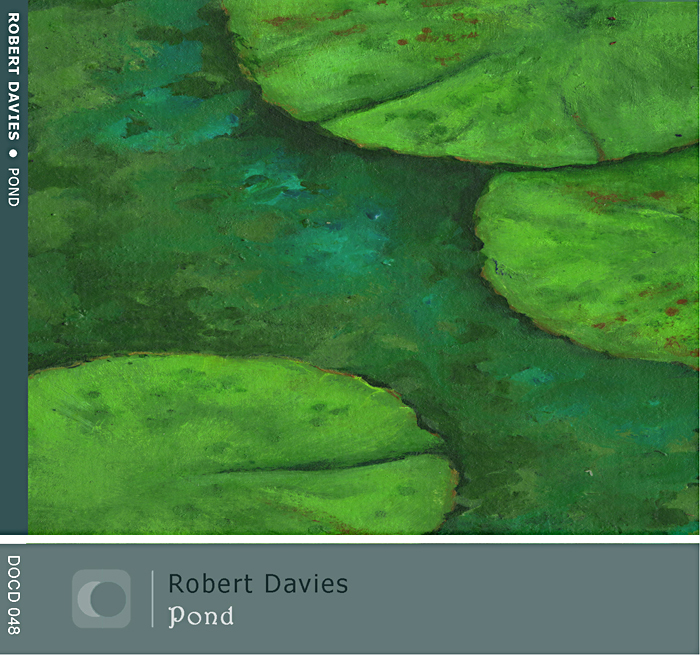 Find your inner pond with Robert Davies. This entry was posted in Uncategorized and tagged ambient, DataObscura, Robert Davies. Bookmark the permalink.